Food temperature plays a key role in preparing, serving and storing food safely. To store holiday leftovers safely, follow these tips from the the U.S. Food and Drug Administration (FDA). Why is this important? The number of bacteria on food sitting at room temperature can double in 20 minutes. Food poisoning from these bacteria can cause serious, sometimes life-threatening illness. Food that has been left at room temperature for more than two hours is not safe to eat. The first step: buy some thermometers. It’s impossible to know if your food is being cooked to a safe temperature or stored at a safe temperature without them. You can buy food thermometers and thermometers for your refrigerator and freezer at grocery stores, hardware stores and discount retailers. Refrigerated food should be kept at 40 °F or below; the temperature of a freezer should be at of below 0 °F. Clean out your refrigerator on a regular basis. Toss out foods that have been there too long, wipe down all shelves, and wash all drawers with warm soapy water. Whether it’s groceries or leftovers, get foods that need refrigeration into the fridge as quickly as possible. Avoid overpacking your fridge so that cold air can circulate. The lowest shelf is the safest place to store raw meat or poultry. Always store it on a plate or dish in case the packaging leaks. Immediately wipe up any spills. 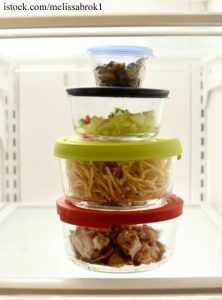 Leftovers should be stored in covered containers or sealed bags. It’s okay to put warm food in the fridge. To help it cool faster, divide leftovers into smaller portions before storing them. Leftovers are usually safe to eat up tot four days after they have been prepared. To view the FDA’s chart on how long specific foods keep in the refrigerator or freezer, click here.